Please note: Quantity and/or subscription discounts will be shown in your shopping cart. Quantity discounts are per flavor. Pre-workouts are a necessity for hitting that optimal peak level of performance during every single workout. Psychotic is one of the strongest pre-workout supplement on the market. 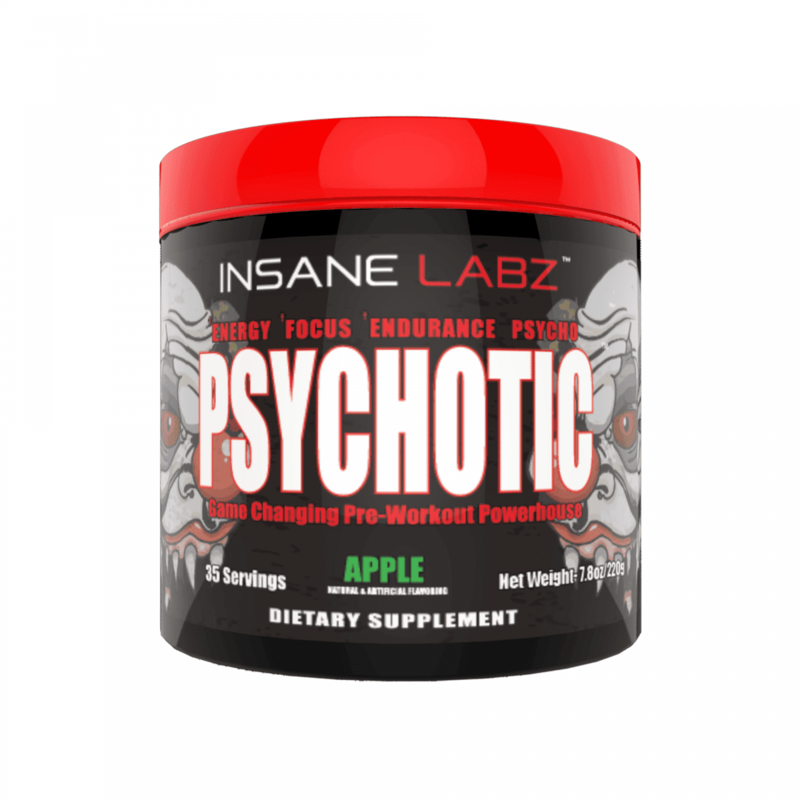 Intensify your energy, focus, performance and results with these proven ingredients. * Demand that your workout is on point every single time! 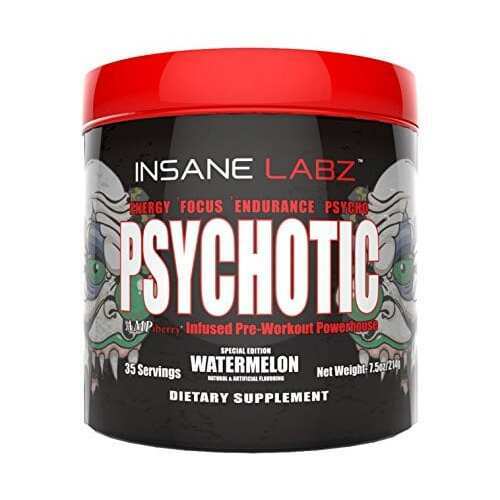 This cutting-edge supplement was specifically designed with ingredients to effectively increase energy, intensify endurance, promote focus and alertness, and give you greater strength output. * To be the best you need the best ingredients! This beta-amino acid raises muscle carnosine levels, increases the amount of work you can perform at high intensities and helps build lean muscle mass. * This number one ingredient expands the anaerobic threshold so you can push yourself harder and work out longer. * It helps so you don’t feel that uncomfortable burn as quickly which means you can get in that last rep.* Beta Alanine is known to give you that tingling sensation in the back of your neck. Creatine monohydrate fuels and gives energy directly to your muscle tissue. * When you ingest creatine it is broken down into adenosine triphosphate (commonly known as ATP) – this is the desired fuel source of your muscles when you pump iron. * Daily creatine use is known to improve workouts due to reducing muscle fatigue. * The more fuel your muscles have the longer you can go and the heavier you can lift. Everyone knows that goals are met when your muscles are under specific tension for periods of time during your workout. Creatine helps you achieve this. Caffeine is a necessity for any pre-workout supplement. Caffeine stimulates the central nervous system which will help you push through till the end. 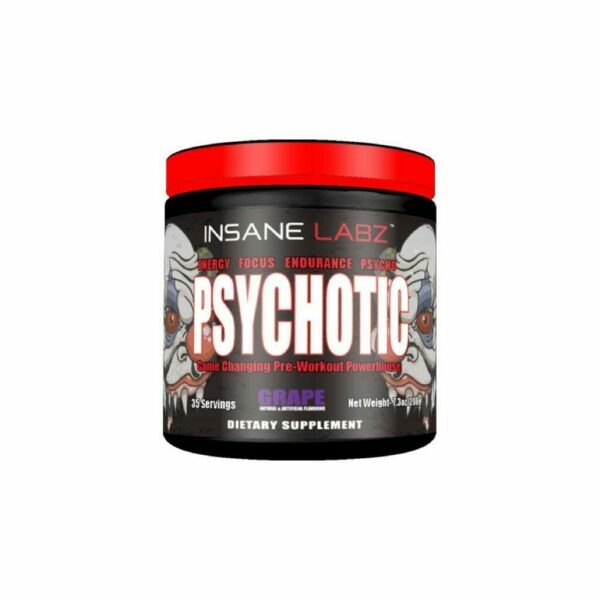 * It brings mental alertness and gives you the energy and motivation to kickstart your workout and help you do that last rep at a higher weight. * Caffeine is also known to help with recovery by decreasing the amount of delayed onset muscle soreness (DOMS). * DOMS are that ache and soreness 24-48 hours after a particularly intense workout. Never worry about that again! Most commonly known as DMAE, this molecule directly supports focus. * Stop worrying about your job, your family, friends etc. – Just focus on hitting your max and staying in the zone. This compound ingredient is commonly known to jumpstart your energy levels. * With increased energy you will not only get in the zone but you’ll feel more motivated to push yourself harder and up those weights. Rauwolfia vomitoria ensures you can get through even the toughest of workouts. * This compound is also supported as a weight-loss supplement when used in combination with a structured workout plan and healthy dieting. 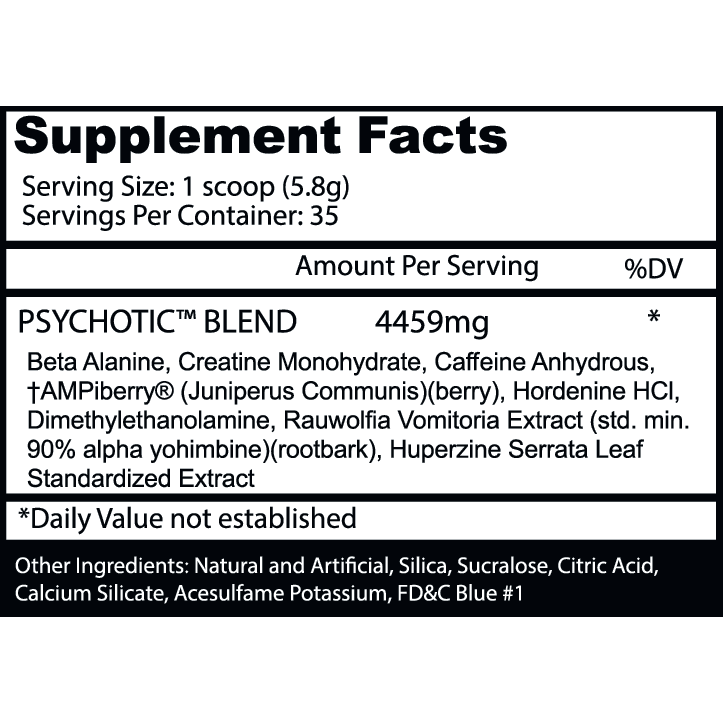 Can I use this pre-workout supplement with others? You can use Psychotic with additional creatine supplements, BCAAs (branched-chain amino acids) and any other proteins that you are consuming. It’s up to you if you decide to stagger your stacks or do it at once. It really all depends on your personal preference. 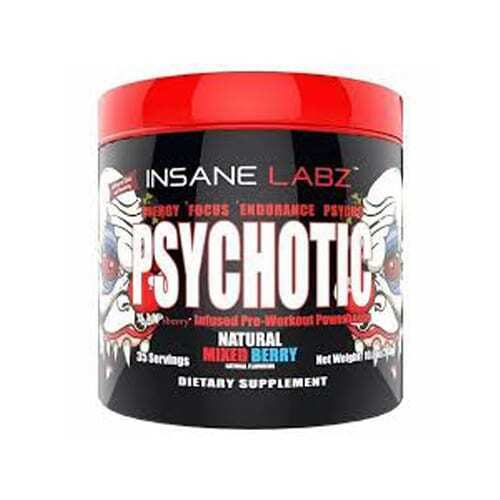 We do not recommend you use this preworkout supplement with any other caffeine or stimulant. Are there multiple flavors to choose from? Absolutely! There are 6 delicious flavors that we offer. Cotton Candy, Fruit Punch, Grape, Gummy Candy, Watermelon, and Apple. We recommend that you try them all and pick your favorite go-to flavor. When should I take Psychotic? Struggle waking up in the morning and hitting the gym before work? Clock out from the job and feel sluggish before getting to the weight rack? Just take this 30 minutes or so before a crazy workout or just to pump you up before a long day. 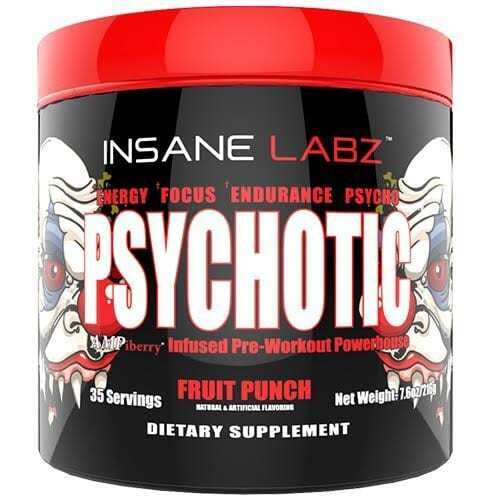 No matter where you are and when you need it Psychotic has your back! Is this supplement for both men and women? As long as you’re a beast and want an insane work out, this pre-workout is for you! How many servings are in each container? There are 35 full powder scoops in each 7.8 oz container. We recommend you start with ½ scoop to assess your tolerance. One scoop of this stuff is the same as 3 or 4 of the other brands. 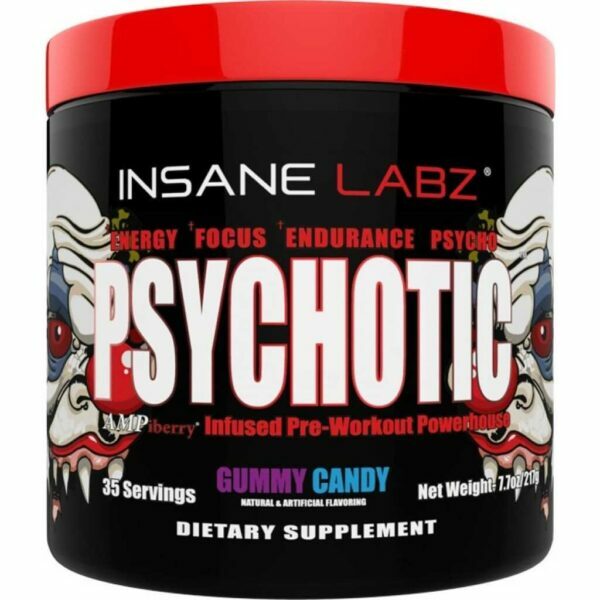 – that’s why we call it Psychotic! Will this make me jittery? It really depends on how much is being consumed and your personal tolerance. That is why we suggest starting with just ½ a scoop and working your way up. How long do the effects last? If taken before a workout you’ll feel the energy and mental boost for several hours afterwards. You’ll definitely have enough time to get in all your sets. It also is dependent on how much you are consuming. But if you’re wondering if you’ll “lose” the edge if you take it too soon – absolutely not. Are there any side effects? Just like consuming a cup of coffee you may become jittery or have trouble falling asleep soon after consumption. But these ingredients have been used in many other products and supplements, we just give you that extra boost. Again, it depends on your body and how much you are consuming. However, we just know that you’ll love the increased performance.